“The APEC house is certainly going to host one of the very most important meetings ever held in this country in November this year. This is an historic event for Papua New Guinea and for the Asia Pacific region. The Issues that are going to be discussed in this particular building will have impact on the global stage. The 21 Nations that are going to be here on that occasion will represent over 50% of global trade and 50% of the global GDP. This 21 Nations play a very important role in the global economy and the economic growth that we continue to have in the region. The Asia Pacific is seen as the engine room for the global economic growth and the meetings are going to have enamours impact on the confidence of investors that are going to come and invest in our country. Many countries around the world and many investors especially do not have much knowledge about our country, they do not know where our country is and do not know the potential of our country. That’s why such global events like this is another opportunity for PNG to show case itself to the investment community all around the world. PNG will be highlighted in every Television stations and Newspapers around the world in that particular week in November and that is an important exposer for Papua New Guinea. I am pleased that this particular building is taking shape according to the timetables that are being set and on schedule and PNG is looking forward to welcoming the leaders that are going to come. I would like to announce that we have already secured the services of the P&O cruisers, three large cruise ships that will be parked here in Port Moresby at our harbour which will cater for 4,000 rooms that will adequately accommodate for all the candidates that will come in to this country, and also in addition to that, Hilton Hotel is now on schedule to be completed well before November. So I want to assure the Nation and our people that we are now ready to host this very important event. Let me also stress again, unlike many of our critics who said that we are spending billions of Kina in terms of hosting this event we all know we don’t have such money. We have spent less than five hundred million kina by the time we finish in November. The benefits that will come to this Nation is far more than what we have spent we have spent. The billions of kina that will be attracted in terms of investment will be far more than the investment that we are making in hosting this event. So lets us embrace this occasion let us work together in welcoming our most important VIPs including the President of the United States , President of Russia , President of China, Prime Minister of Japan, and many of the other global players that we read and hear about are going to make a first time trip to Papua New Guinea, and on that occasion let us showcase our best. Let me thank the constructors of this building. Oil Search our partners in developing this building. 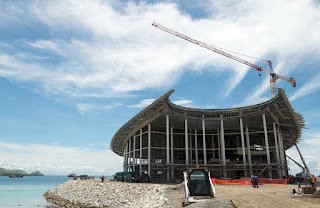 APEC Minister and his staff and all the construction workers and every person who is involved in this process without your contribution and without your efforts we will not make it a success. Let us stay focus and let us perform beyond our expectations to showcase the best of our ability so that we will be able to have a very successful APEC meeting in PNG.